mommy bytes: What's in the box? Melissa over at Taking What is Left had a contest for her first blogiversary, and graciously offered home-baked cookies and a Barnes and Noble gift certificate. And yours truly was the lucky winner! Her son picked my name the old-fashioned way, where I always use random.org. I guess it is the lazy geek in me ... We waited with bated breath as she and her son made the cookies before our very eyes. 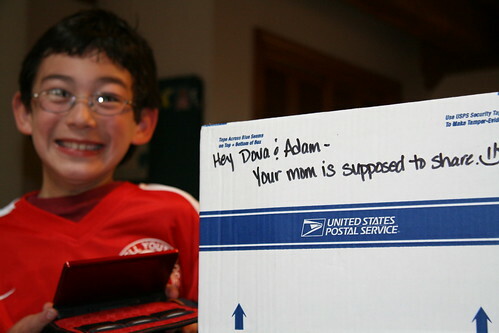 We received the package on Adam's birthday before his party so we had to set it aside. But not before taking a picture of the box with this mysterious message. The next day, we cracked open the box to find these goodies: two huge tubs of cookies, a $25 gift certificate from Barnes and Noble and a bookmark with a George Eliot quote that says, "It is never too late to be what you might have been." The kids and I sampled a few cookies in the top tub before the picture, but Doug passed on them. I was wondering if he wanted to make sure that they weren't poisoned. I took the kids out for errands in the afternoon and when we got back, the tub was empty! Seriously, all those cookies were eaten by Doug, who has a known cookie problem. Of course, we were not all poisoned and thankfully Doug didn't have a heart attack from all that butter (according to the recipe, each bin would have 1/2 cup of butter, or TWO STICKS). I banned Doug from the second tub, but took pity and allowed him to have a few more. So Melissa, thanks for the warning note on the box, but you got the subject wrong - Your DAD is supposed to share . 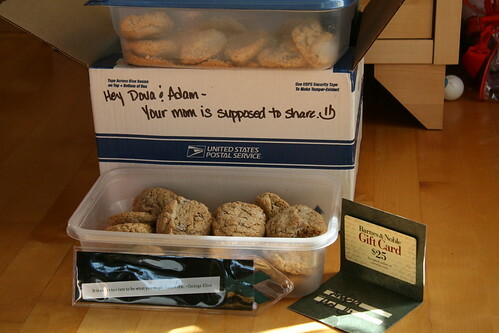 And thanks for the cookies, they were totally delicious !